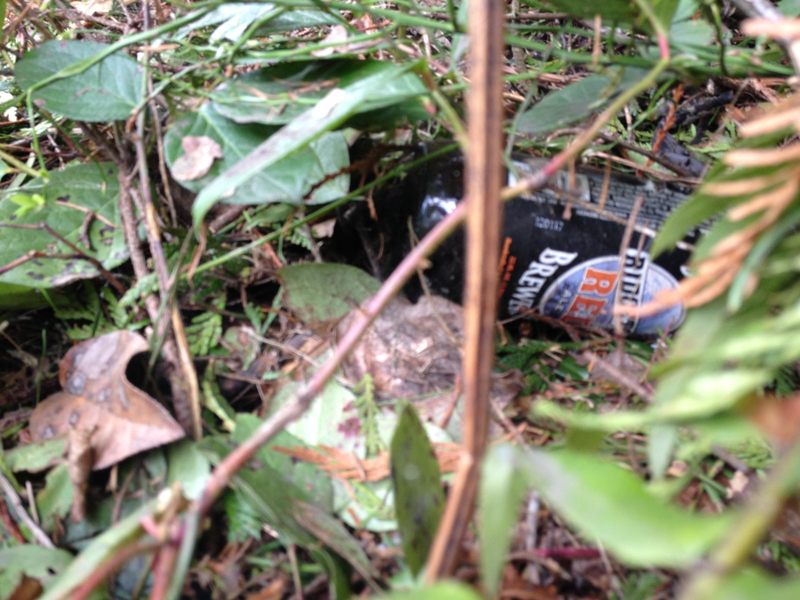 Updated March 19: Discarded Alcohol Containers: What Can They Tell Us? 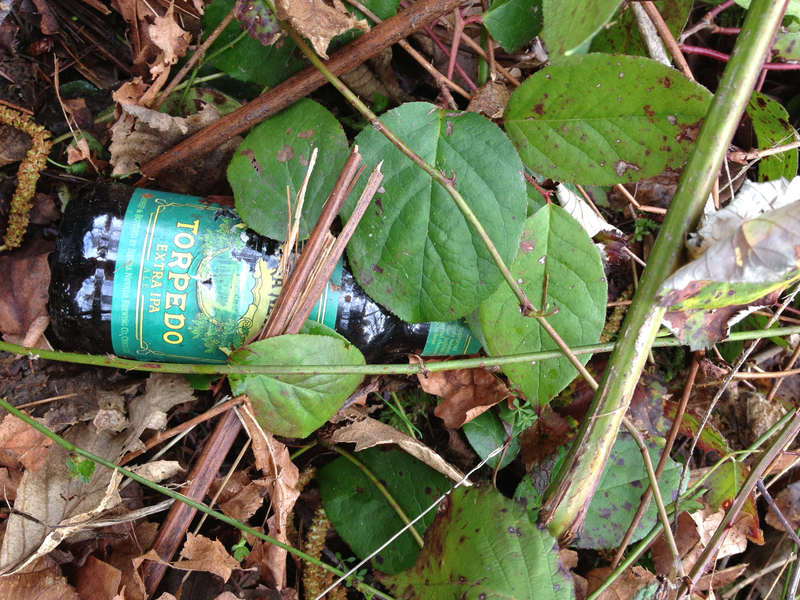 Discarded alcohol containers. They’re a by-product of life. I suspect no city or town in the world is without them. One of the banes of the cyclist, and one of my banes particularly when I lived and rode in the Southwest is broken beer bottle glass scattered in the shoulder of the road. Just why this problem is more prevalent in the SW is fodder for another of my entries perhaps. 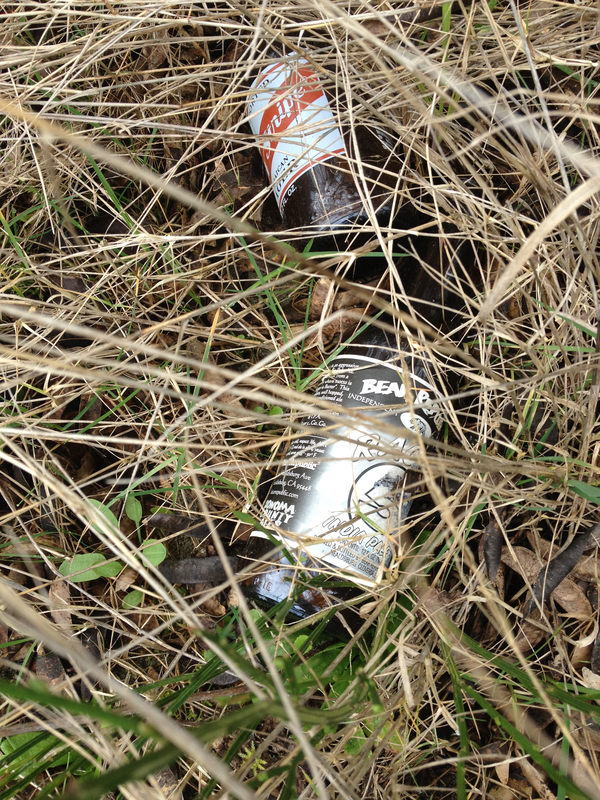 In terms of beer containers – be they bottles or cans – what kind are you picturing right now? What brands? Below are a few pics from a walk I took today. 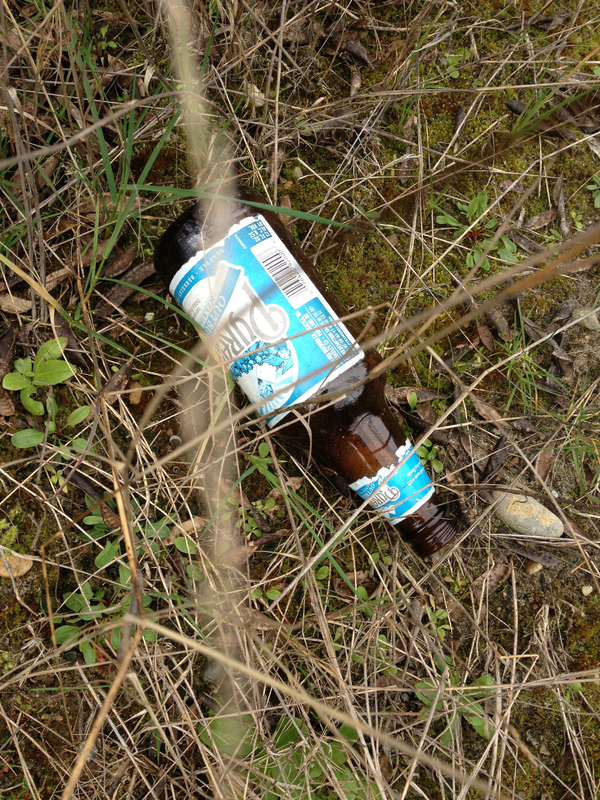 Evidence of the PNW being a major hub for high quality microbrews? Evidence also of the town/area in which I live and walk being affluent? (I may live on Bainbridge Island but I ain’t). It’s clear that the discarders favor stronger brews. Makes sense, doesn’t it? Full disclosure: I did also step over some Busch and Budweiser cans. I suppose those are present everywhere. It is the presence of the pictured – which were by far the most numerous – that raises the questions I present for your consideration. Remember, these pics were snapped during just one brief walk. 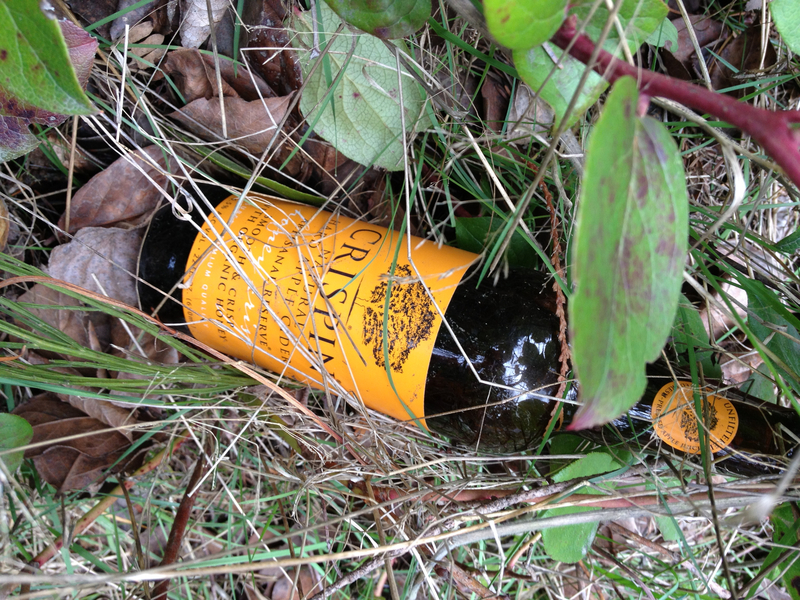 More pics from this walk will follow, including one of a cider bottle. Also, a picture I am trying to track down depicts a bottle wrapped in a brown paper bag sitting empty atop a newspaper rack in town. The bottle? A 22 oz. Pyramid Outburst Imperial IPA. Sadly, I think that picture died with my Blackberry phone. (See my blog post on that event). Whatever the implications, I do wish (in vain) that the beer-vessel-tossing doorknobs would stop chucking the bottles from their moving motor vehicles, leaving the broken glass in the bike lanes. 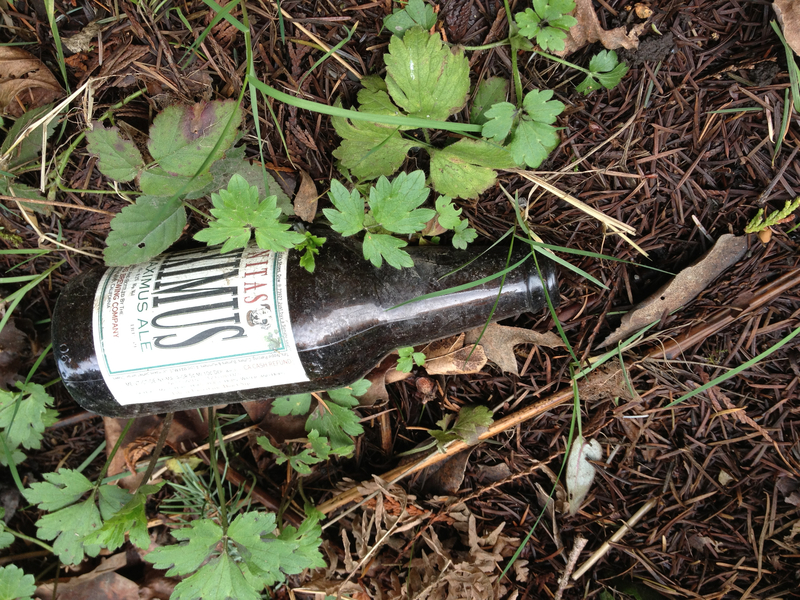 As I upload these last pics, I am again amazed that all these bottles were photographed during one single brief walk. Perhaps we need to start a program akin to the needle exchange program. The government could make available to folks reveling with bottles after dark recycling bins where bottles could anonymously be deposited. Speaking of needle exchange programs, I did come across a hypodermic needle in the vicinity of where I found the cider bottle. Readers, allow me a few moments to provide my take on a topic of profound importance – one that seems to be surfacing with increasing frequency: Imposing registration requirements and taxes on cyclists. Just like the absurd notion that cyclists are required, at a stop light or stop sign intersection, to stop behind the last car in line and “wait their turn”, not advancing past even one car, taxing cyclists runs directly counter to what cycling is all about. If I have to ride that way, I almost may as well do so from the safety and comfort of my car. Charging/taxing cyclists goes against everything that cycling is about and takes away some of its benefit. I know there is a (and if this comment forum is any indication, surprisingly large) contingent that is adamant that cyclists should pony up; I have no personal knowledge of how roads are paid for, as in which taxes and fees go where. I don’t need to know. I know all I need to know: Drivers are afforded many advantages including the ability to go long distances fast, while dry, warm and comfortable, able to spread out, eat, play and relax inside their protective shell. While comfortably protected in relative anonymity, they mete out injustices on fellow drivers and on cyclists. We cyclists endure vastly more dangers and injustices each time we ride than do drivers. Each time a driver passes us too closely and fast, each time a driver goes ahead and turns in front of us because we’re just a cyclist, each time we are blown off and endangered by oblivious and distracted drivers – each time – it’s unjust. To take away one of the fundamental advantages of cycling – freedom – by imposing a tax or registration fee on us and making us register and display a tag is, plainly stated, wrong. I know this justice argument will be shot down half a dozen different ways by the militant out-of-my-way, I’m a car driver set. But I still believe it’s true and right. You noticed I admitted to not knowing how roads are paid for. I have heard it posited by many different folks that the idea that cyclists don’t pay their fair share is incorrect because roads are paid for mostly by property taxes, sales taxes etc. Further, there is the fact that most cyclists also own at least one car and thus pay its registration. I tend to believe these folks over the anti-cyclist folks, most of whom seem to be simply presenting an uneducated, emotional argument that states that bicyclists should pay their fair share. To be fair, I suppose I could be accused of doing the same, what with my not having done my research. I have not, however, heard any valid counterargument to my position. I will also mention the wear and tear argument which I hold to be true – cyclists cause almost none. Drivers, the majority of them driving vehicles that are unnecessarily large, all the while are drifting over fog lines (you know, the white line that is the only separation between the car lane and the shoulder, if one exists) and wearing said lines away; this of course places wear and tear on the shoulders/bike lanes, causing them to crack and crumble. Go ahead and start observing next time you’re on the road. Observe just how much time drivers spend with their tires on or over the white line – especially on the inside of a curve – exhibiting a pathetic level of care and skill in piloting their vehicle. Let’s end by presenting the idea that many anti-bike folks find so arrogant: The idea that cyclists are doing everyone a favor. Look, I don’t get in the saddle thinking I am better than others. It is true, though, that each trip someone makes by bicycle instead of in a car or truck is providing many benefits to the community, to society and yes, the planet. I won’t get into them all. Instead I’ll mention a couple that I find most important: 1) reduction of road congestion 2) replacing one experience of social isolation and hostility with an experience of achievement, satisfaction, well-being and openness. A principle I have discovered: Terrible things happen to otherwise good people when they sit behind the wheel. Look at the way people mistreat each other while driving and ask yourself if these people are really the rude, indifferent and sometimes outright aggressive people they appear to be. What is the cause? Motor vehicles, of course, are absolutely essential in society and provide irreplaceable benefits. These benefits come at a terrible price to society. Getting on a bike and pedaling along has always been a beautiful experience – for me the same as it was when I was a kid. If you like to live simply and take some refuge from the myriad ways life attacks you, a bicycle can be an answer. I realize many people have physical and/or geographical limitations that prevent them from getting places on a bike. I don’t want to disregard them or their situations. I am deeply grateful to be able to ride my bike for many of my transportation requirements and desires. There is nothing quite like, in the face of rising fuel prices, increasing cost of living, constant bills in the mailbox, constant home and car maintenance problems, and on and on, saying chuck it! I am getting on this plain, cheap old bike and rolling to my destination under my own power and doing so for almost zero dollars. If the bike breaks, I will limp home and then have it fixed or just ride one of my other bikes next time. It’s one of the closest things in this life to freedom. It is simplicity and, until that first motorist disrespects/endangers me on my trip, happiness! Tax and register cyclists? You will each decide for yourselves. I am convinced it is exactly wrong.